...move to Minnesota. Here in Texas, I think summer is about to commence. The overnight lows will be jumping from the mid 60s to the mid 70s tomorrow, if the weather dude is to be believed. Next week, highs are predicted in the mid 90s. Sure smells like summer to me. So, it was time for the annual Hanging of the Fans in the barn. Not an immense job, but one that hadn't made it to the top of the list, until today. 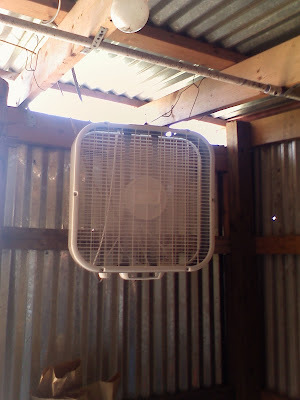 Now all three stalls are equipped with box fans to keep the hot humid air from descending into the barn and unpacking its bags for a 5 month visit. I'm hoping the moving air will also discourage the flies. The sheep are still enjoying spending the day in the north lot, munching on poison ivy, little elm tree seedlings, wildflowers, wild grape vines, Bermuda grass turf, and some stray Johnson grass. Ted was absolutely amazed at how much poison ivy those sheep put away yesterday, with apparently no ill effect. It really works having the sheep clear the brushy stuff! Very cool. We had a special visitor today - my friend Peggy who I hadn't seen in about 15 years. Peggy got the nickle tour of the farm and an impromptu spinning lesson. She went home with a student spindle and some Jacob roving to keep the fibery goodness going. Peggy is a professional writer who learned to spin 20 years ago and is hoping to take it up again. She got that spindle singing before she left... she'll have it full of wonderful yarn in no time! This is a good time to remind everyone that I'll be available for spinning lessons every third Saturday from 10 - Noon in the Little Red Barn. Come if you want to learn. Come if you already know how. Just come! 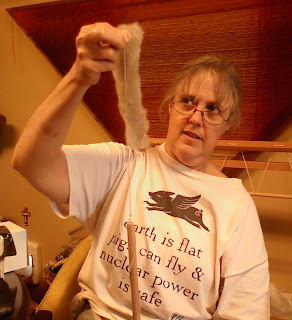 And if you're free tomorrow morning about 9:30 or so, we'll be cleaning the last few alpaca fleeces for the 2009 fiber harvest. The mornings are going to start getting warmer, so there's no time to lose! Must get work done before mercury climbs! Join us if you can; we'll miss you if you can't. I'll be thinking of the skirting crew tomorrow! That might have to be my newest bumper sticker (that I can add to the hundreds of others I never had printed up): "I'd rather be SKIRTING FLEECE." At least people might stop to wonder for a minute or two...Good work on the fans, Cindy. And GREAT spinning, Peggy! I love your T-shirt. damn, i still can't get out...no driver! but you watch out cus one of these here days, i will ..be forewarned! Ouch~! Just saw the post on what time to be there and I am sitting here in my pajamas @ 9:25!! Better get a move on....better late than not at all I guess!! That post clock is off! It should read 9:27 a.m.!! !